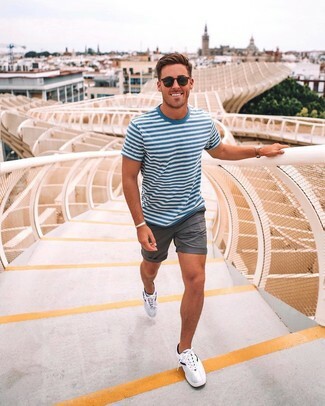 If you're all about functionality dressing when it comes to fashion, you'll love this stylish pairing of a white and blue horizontal striped crew-neck t-shirt and blue jeans. Wearing a pair of charcoal plimsolls is an easy way to add some flair to your outfit. 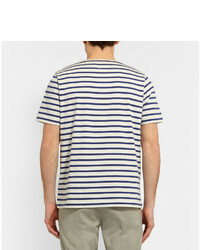 Try teaming a Margaret Howell Mhl Striped Cotton T Shirt with grey shorts for comfort dressing with a contemporary spin. Add a mellow vibe to this ensemble by finishing off with white athletic shoes. 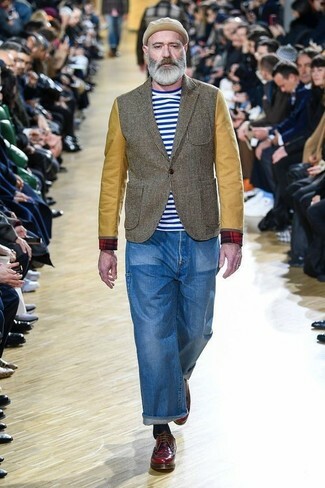 We're all looking for comfort when it comes to dressing up, and this combination of a Margaret Howell mhl striped cotton t shirt and navy jeans is a perfect example of that. 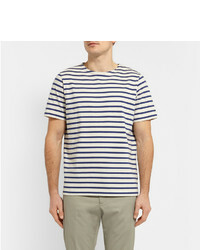 This combo of a Margaret Howell mhl striped cotton t shirt and khaki chinos is clean, dapper and very easy to recreate. 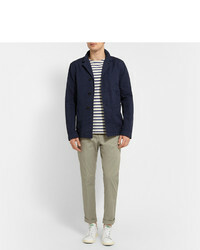 When it comes to footwear, this outfit is round off wonderfully with white low top sneakers. 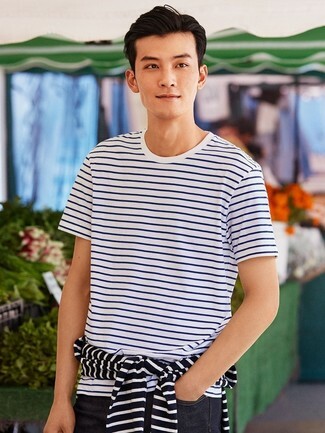 If you're all about relaxed dressing when it comes to your personal style, you'll love this simple pairing of a white and blue horizontal striped crew-neck t-shirt and charcoal shorts. White low top sneakers work amazingly well here. If you're after a casual yet stylish outfit, try pairing a white and blue horizontal striped crew-neck t-shirt with pink chinos. Both items are totally comfortable and will look great paired together. Blue low top sneakers work amazingly well within this look. 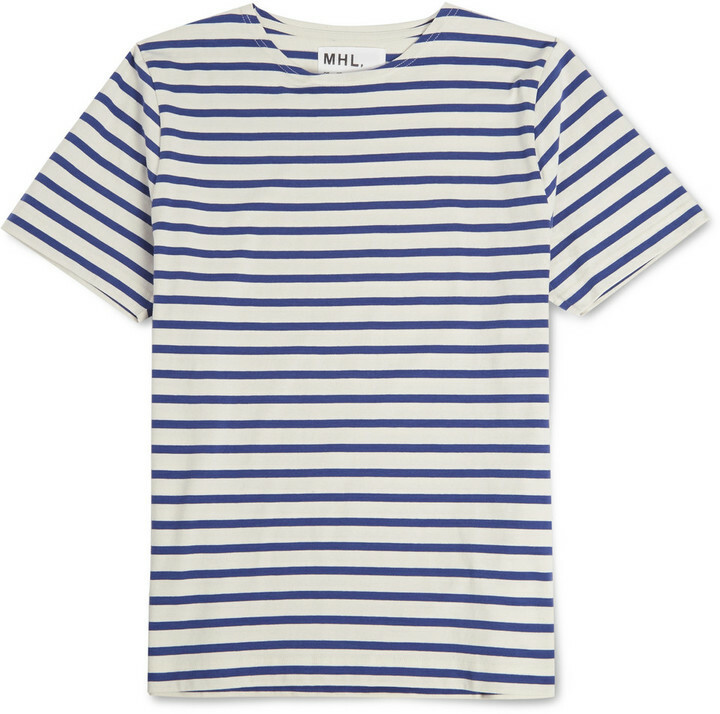 If you're all about practicality dressing when it comes to fashion, you'll love this on-trend combo of a Margaret Howell mhl striped cotton t shirt and blue jeans. Sporting a pair of burgundy leather derby shoes is a simple way to add some flair to your look. If you're on the hunt for a casual yet dapper ensemble, try teaming a Margaret Howell mhl striped cotton t shirt with navy chinos. Both garments are totally comfortable and will look great paired together.